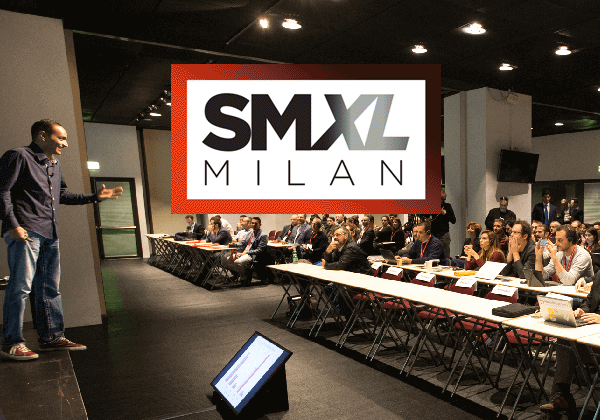 SMXL Milan is a Search + Social Media Marketing Conference that launched in Italy in 2016, to cover the void from top search marketing conferences such as SES and SMX who both decided to focus on other international markets. Fiera di Milano Media, through their company Business International, got in touch to invite Massimo Burgio as Chairman of the new conference – the invitation has been obviously gladly accepted. As Chairman of SMXL Milan 2016, Massimo Burgio has curated the agenda, invited speakers and keynote speakers among the top international expert of search and social media marketing, and presented and moderated the conference in Milan in November 2016. Besides of the work personally done by Massimo Burgio, Truly Social presented an offer for the conference website, that was missing. The original SMXL Milan website has been a complete work from scratch for our team: logo design, corporate identity, all customized images for both the website and the event’s communication, a fully responsive, bilingual and SEO-optimized website, content development, and the creation and optimization of several social media spaces for the new conference – including Facebook, Twitter, YouTube and Pinterest. After the 2016 conference, Truly Social also created a “coming soon page” for the following SMXL Milan 2017 conference, plus an archive for the 2016 conference websites (english and italian versions) that also give access to the back-up of the SMX Milan conferences organized by Business International in the years 2013-2015. The latest SMXL Milan website currently online, featuring the 2017 conference, has been built by BI’s internal resources on top of the design created for the coming soon page, unfortunately not putting much creative effort in it.